A sheet of replacement glass from Sedak arrived Friday morning. Photos courtesy of Steve Giralt. 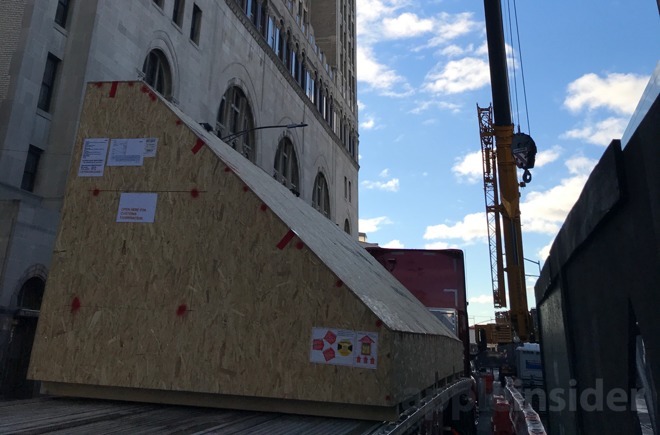 Spotted by AppleInsider reader Steve Giralt, a flatbed truck carrying the huge sheet of glass parked outside of the anticipated store, awaiting its installation at 300 Ashland Place. 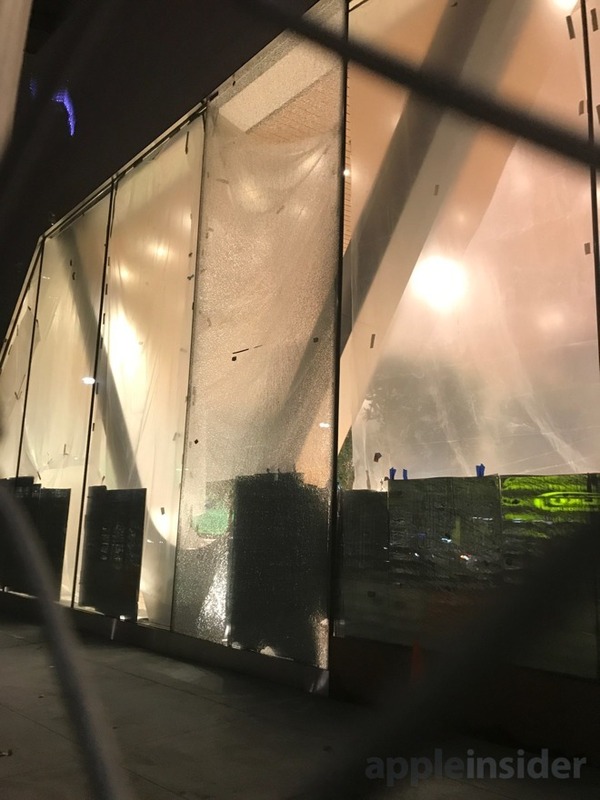 Apple has been working night and day to finish the store in time for the holiday shopping season, but suffered a setback when one of the location's floor-to-ceiling pieces of glass shattered. 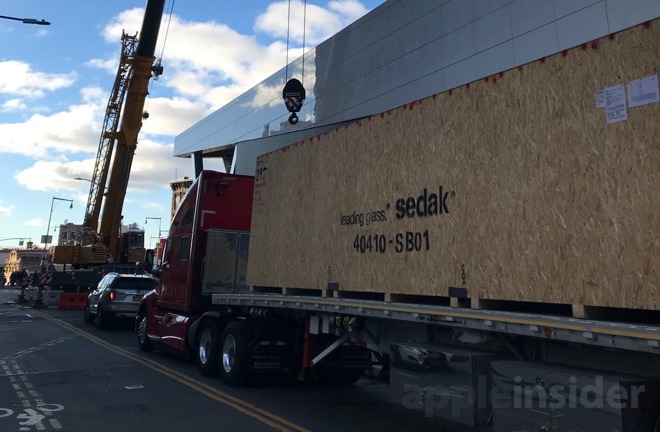 Sedak has made custom glass for other retail stores, as well as Apple Park HQ in Cupertino. Photos courtesy of Steve Giralt. Apple has worked with Germany's Sedak before —the company is responsible for the unique curved glass at the Apple Park "spaceship" campus in Cupertino, and also made custom glass for the Fifth Avenue cube and Upper West Side glass roof at Apple stores in Manhattan. Given the 24/7 construction at the site and the rush delivery of the glass, it's possible that Apple is hoping to open its new store before next week's lucrative Black Friday shopping holiday. As of this Friday morning, the storefront is now shrouded in black, suggesting the company could be putting the final touches on its second store in New York City's most populous borough. An artist's rendering of the storefront at 300 Ashland Place. The new store's location is just steps away from Atlantic Terminal, a major transportation hub in Brooklyn. It is also adjacent to the Barclays Center, home of the Brooklyn Nets, New York Islanders, and countless concerts and events. The prime Fort Greene location is a few miles south of the Williamsburg store Apple opened in the summer of 2016, which holds the distinction as the company's first in Brooklyn. Most of Apple's ten New York City stores are located in Manhattan. The shattered pane of glass, as seen earlier this week. As is Apple's policy, the company has yet to even confirm that it is opening a store at the corner of Flatbush Avenue and Ashland Place, though a hastily shrouded Apple logo spotted in recent days left little to the imagination. The company was first reported to have signed a 10-year lease for the spot in January.